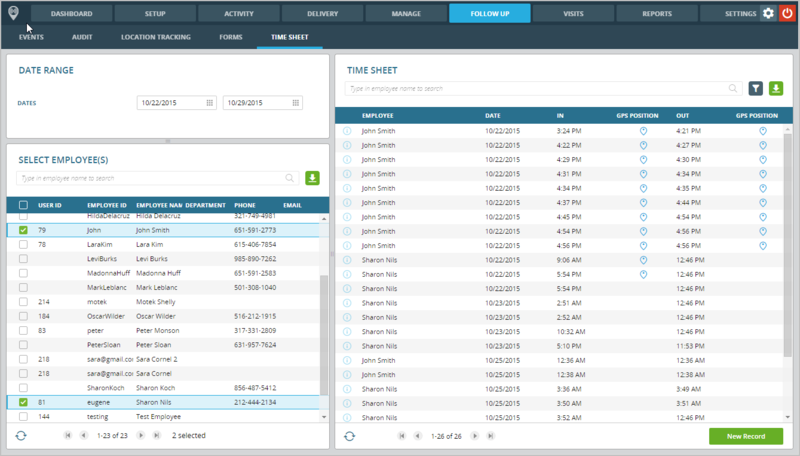 Employee attendance module in Patrol-IT, allows the company’s employees to report attendance using their smartphones. The attendance report includes clock in and clock out times, as well as break times. The attendance reporting may be set to be optional, or mandatory, before starting any sort of daily activities, reporting of checkpoint visits or any events. Any attendance reporting also includes the employee’s location, which is detected when the report is submitted by the employee. In addition, it is possible to set up an attendance reporting based on location, meaning, an employee in the field would be able to report his shift starting and ending times only if he is physically present in the location set for him. This feature prevents employees from submitting false attendance reports when in fact they have not reached the location set forth for them to perform their tasks by the employer. All attendance reporting data is available for viewing on the server and ready to be printed. The data may be edited by the supervisors. Additionally, there is an option to export attendance reports to external systems. Usage of this module prevents errors in attendance reporting, spares the need of manually collecting the data from each employee, as well as the need to use attendance forms and retyping them into the system.